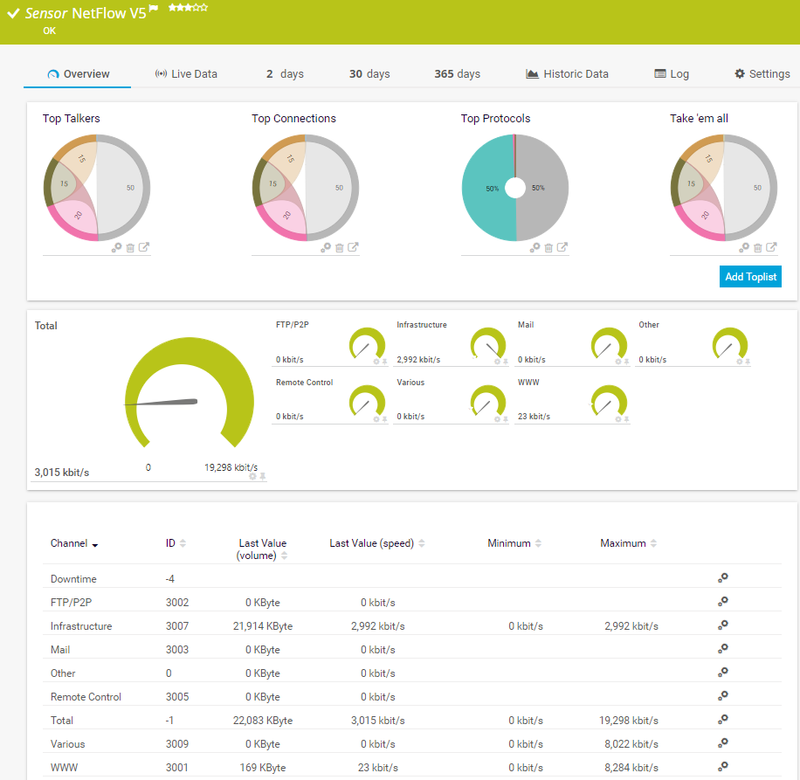 The NetFlow V5 sensor receives traffic data from a NetFlow V5 compatible device and shows the traffic by type. Ensure the sensor matches the NetFlow version your device is exporting! There are several filter options available to divide traffic into different channels. Note: You must enable NetFlow export of the respective version on the monitored device for this sensor to work. The device must send the flow data stream to the IP address of the PRTG probe system on which the sensor is set up (either a local or remote probe). Note: When configuring export, make sure you select the appropriate NetFlow version for this sensor. Select the IP address(es) on which PRTG listens to NetFlow packets. The list of IP addresses you see here is specific to your setup. To select an IP address, add a check mark in front of the respective line. You can also select and deselect all items by using the check box in the table head. The IP address selected here must match the one you have configured in the NetFlow export options of your hardware router device. Enter a time span in minutes after which new flow data must be received. If the timeout is reached and no new data was received during this time, the sensor switches to an Unknown status. Please enter an integer value. We recommend that you set the timeout one minute longer than the respective timeout configured in your hardware router device. The maximum timeout is 60 minutes. Please see section More for more details about this setting. Note: If you set this value too low, flow information might get lost! This field is only visible when sampling mode is enabled above. Enter a number that matches the sampling rate in your exporter device. If the number is different, monitoring results will be incorrect. Please enter an integer value. None (recommended): Do not write additional log files. Recommended for normal use cases. Only for the 'Other' channel: Only write log files of data that is not filtered otherwise and therefore accounted to the default Other channel. All stream data: Write log files for all data received. Note: Use with caution! When enabled, huge data files can be created. Please use for a short time and for debugging purposes only. File Transfer: Traffic caused by FTP. Chat: Traffic caused by chat and instant messaging. Remote Control: Traffic caused by remote control applications, such as RDP, SSH, Telnet, VNC. Infrastructure: Traffic caused by network services, such as DHCP, DNS, Ident, ICMP, SNMP. NetBIOS: Traffic caused by NetBIOS communication. Citrix: Traffic caused by Citrix applications. Other Protocols: Traffic caused by various other protocols via UDP and TCP. No: Do not account traffic of this group in an own channel. All traffic of this group is accounted to the default channel named Other. Yes: Count all traffic of this group and summarize it into one channel. Detail: Count all traffic of this group and further divide it into different channels. The traffic appears in several channels as shown in the Content column. Note: Extensive use of this option can cause load problems on your probe system. We recommend setting specific, well-chosen filters for the data you really want to analyze. Note: You can change the default configuration for groups and channels. For details, please see section More. Define if you want to filter any traffic. If you leave this field empty, all traffic will be included. To include specific traffic only, define filters using a special syntax. For detailed information, please see Filter Rules for xFlow, IPFIX, and Packet Sniffer Sensors section. First, the filters defined in the Include Filter field are considered. From this subset, you can explicitly exclude traffic, using the same syntax. For detailed information, please see Filter Rules for xFlow, IPFIX, and Packet Sniffer Sensors section. For all flow and packet sniffer sensors there are Toplists available on the Overview tab of a sensor's detail page. Using toplists, you can review traffic data of small time periods in great detail. For more information, please see Toplists section.